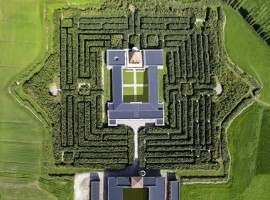 The low and verdant countryside of the Po Valley a few kilometers from Parma takes us to the discovery of the largest maze in the world. 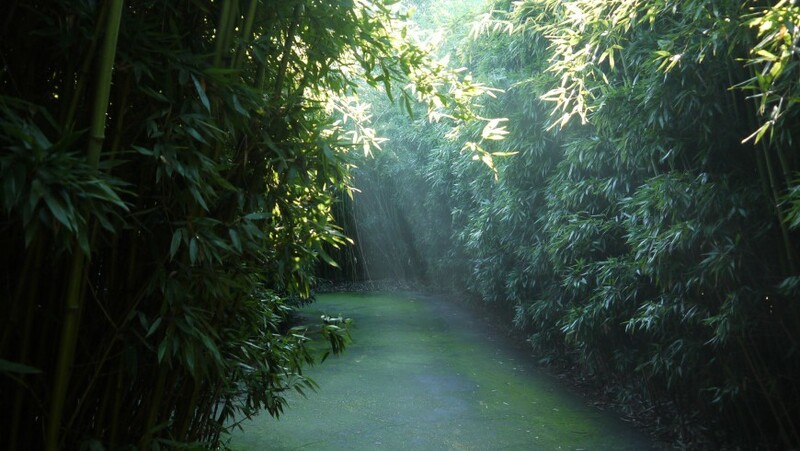 A tangle of green paths bordered by bamboo in which the children can not wait to get lost, run and chase. 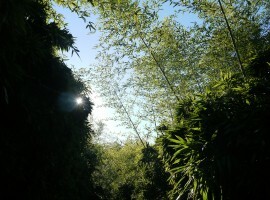 We follow them enchanted by the sun rays that penetrate between the high walls of bamboo canes. We listen to their cries of joy and the wind slightly blowing in the reeds. We are minutes away from Fontanellato, a village famous for its ancient castle, and less than half an hour from the food capital, Parma, that from Parmigiano Reggiano to meats enchants tourist with its delights. But the maze brings us also far away. The many species of bamboo make us travel with the mind towards the Far East, while architectures inspired by the visionary paintings of Boullée and Ledoux take us back in eighteenth-century France. A journey within a journey that begins with the remarkable story of this labyrinth, which is intertwined with the life and passions of Franco Maria Ricci, designer, esthete and art lover, the famous publisher in the world. The history of the largest maze in the world begins with the daydream of a child amazed by the first labyrinths of mirrors discovered on the funfairs. The passion for mazes of Franco Maria Ricci continues during his studies of geology, when he loves to explore the caves, venturing where the lines are never straight and in just a moment you can get lost in deep tunnels. In the sixties, Franco Maria Ricci shelve the dream of mazes and undertakes the profession of graphic designer and publisher. 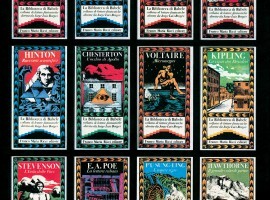 He develops its own editorial policy, which will become famous around the world, using the Bodoni font and the color black, which gives a sense of timelessness to his books almost turning them into works of art. The meeting with the Argentine writer Jorge Luis Borges brings back his great passion. 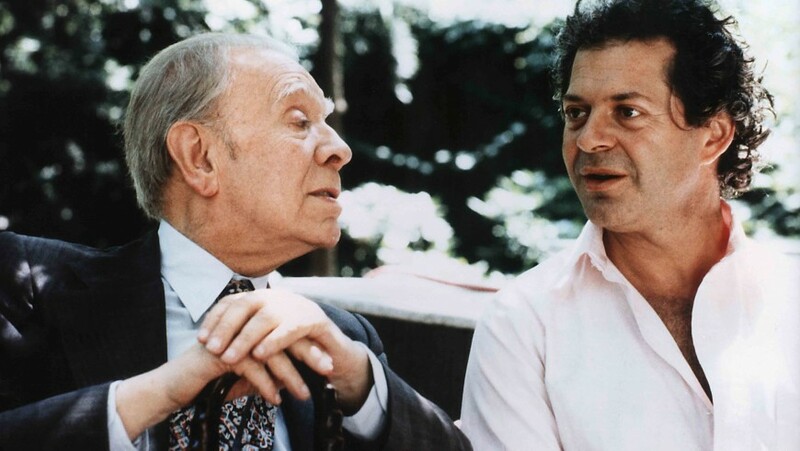 Ricci proposes to Borges to come to Europe and to cooperate with its editorial series. Thus a friendship and a deep partnership were born. Borges directs the series “The Library of Babel” where he uses the labyrinth as a metaphor and constant symbol. When I spoke with Borges – Ricci tells – the arguments were not so many, and one of them was the maze. One day, while I was walking with him in the countryside next to my family estate, I revealed to Borges my dream: I want to build the largest maze in the world. Borges told me: the largest labyrinth of the world already exists. It’s the desert! 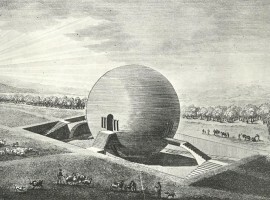 The dream began to take shape at the beginning of the new millennium, when Franco Maria Ricci gives FMR brand and picks up the labyrinth project, along with a college student, Davide Dutto. Together they fantasize about huge projects for incredible mazes. 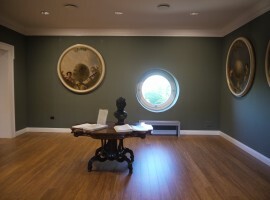 Ideas become reality, and the labyrinth becomes an opportunity to fix and expose the family art collection, which is housed in the heart of the large garden. 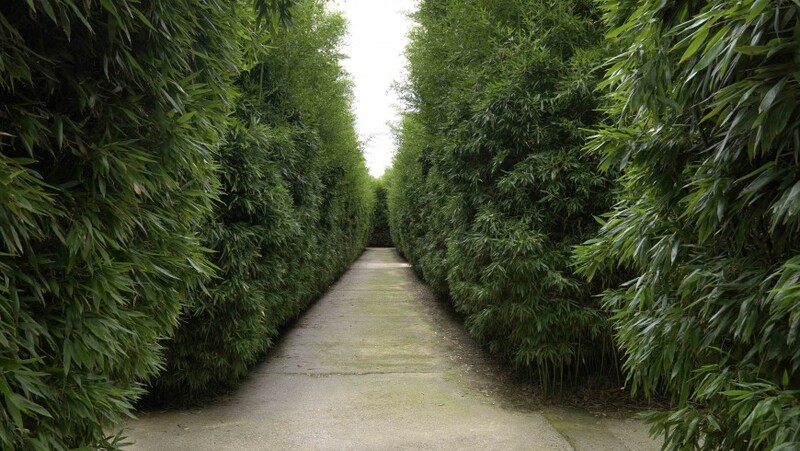 Bamboo is the dominant element in the Maze of Masone, in the province of Parma. 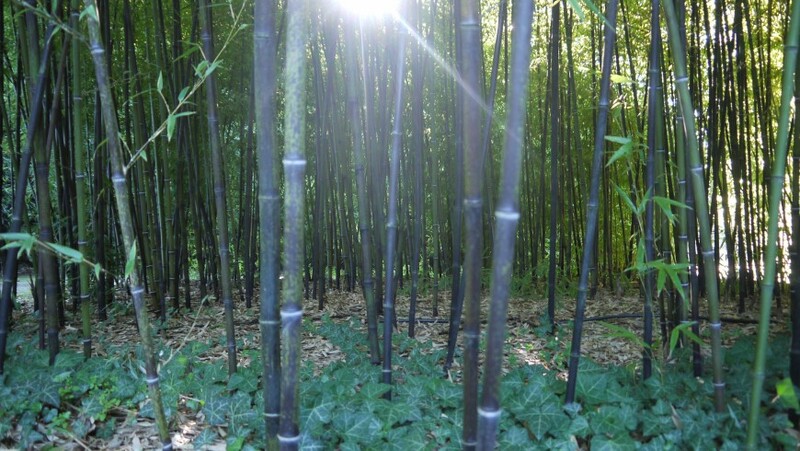 There isn’t only the green bamboo, the most common and widespread species, but also the black bamboo stem, or the yellow stem, the dwarf and the giant. 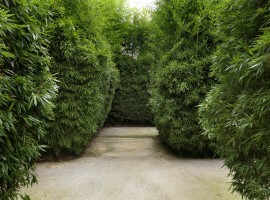 So a walk in the labyrinth becomes a path in a huge botanical garden that collects 200,000 plants of 20 different species of this plant famous for its ability to grow fast. Think that can grow up to 60 cm a day! Bamboo is also an ecological plant, because it is able to store huge amounts of carbon dioxide (CO2). 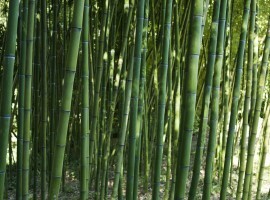 All plants do, but bamboo is particularly efficient in those terms. Some species can even produce 35% more oxygen than it would produce the same surface covered with other tree species. The adventure begins in the maze without a map. Here and there you can find points of information and references that we decide not to look. 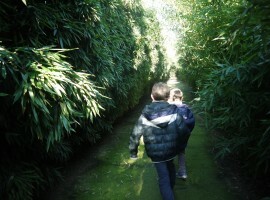 The beauty of the maze is getting lost and the children immediately adopt this “philosophy”. Everything becomes magically an amazing adventure. Their legs are moving fast through the alleys, gaze wanders over the bamboo hedges, their little voices chase cheerful. For us adults is a time of relaxation. We return children and the temptation to rush to find out first the exit is too strong. We just want to get lost and to stop a little to enjoy the silent greenery that surrounds us. 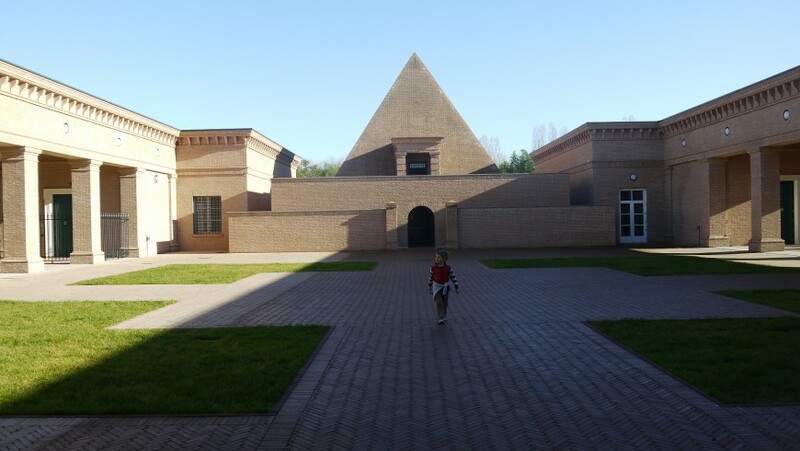 Found the exit of the maze, the route continues through the discovery of unique art works exhibited in fantastic spaces, which are able to excite even the children. 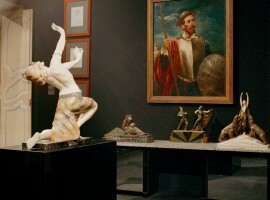 The buildings of the maze home more than 500 works including paintings, sculptures and art objects: from Bernini to Ligabue da Carracci to his precious Jaguar 60s. The spiral staircase leads us at the top offering us a new view of the maze. Immediately after, the large brick courtyard welcomes us for a relaxing time in the sun. Here and there still return the bamboo canes to remind the memorable experience in the maze. 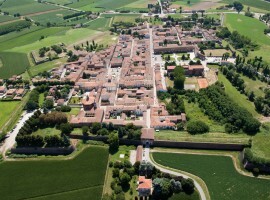 The plan of the maze is in the shape of star, inspired by the Renaissance fortified cities, like that of nearby Sabbioneta (Mantova) or Palmanova (in the province of Udine) – Orsola explains to us. She’s a young designers, expert in Labyrinths, who for years worked with Franco Maria Ricci . The perpendicular and parallel paths are enveloped by greenery, interrupted by traps, junctions and dead ends. In Greek mythology, the Labyrinth was a symbol of power and hid in their heart the terrible Minotaur. In the Middle Ages it became a symbol of faith, and the images of mazes are often repeated often in cathedrals. In the eighteenth century the Labyrinth is a symbol of pleasure, is the joy of getting lost and find yourself. The Franco Maria Ricci Labyrinth embodies all these ideas of Labyrinth, creating a contemporary version of the myth. It’s a fantastic garden for children, who can hide and chase, or participate in a great outdoor treasure hunting. A maze of meditation in nature for those who go alone in a sunny day. But also a romantic landscape to cross in two. For us it was above all an experience of nature and art. But also the pleasant surprise of a story that we will not forget: that of a lifelong dream come true. 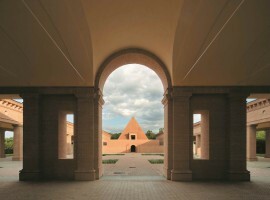 Parma has always been a place of delight, cradle of precious works of art and gastronomic uniqueness. 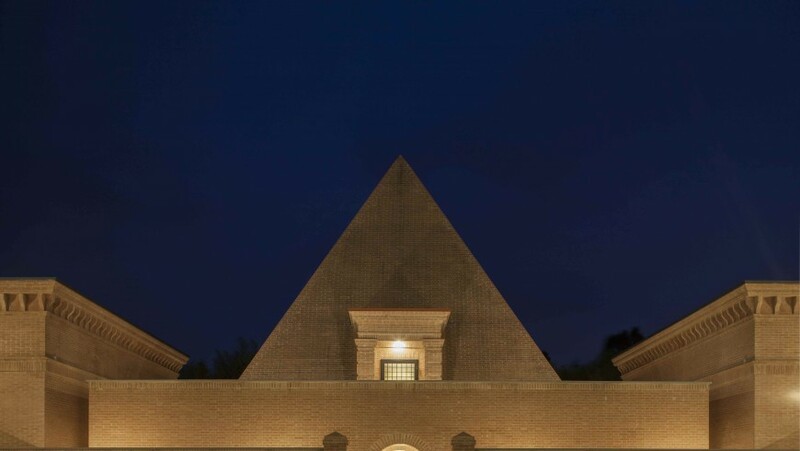 After the visit of the maze you can stop at a nearby restaurant, and then visit Fontanellato, with its beautiful old town, the Rocca Sanvitale, with frescoes by Parmigianino, or you can discover the artistic heritage of Parma. Inside the Labyrinth you can enjoy typical Parma cuisine in the elegant restaurant of Spigaroli Brothers, celebrity chefs in Parma. 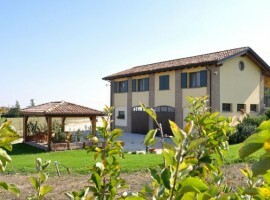 Not far from the maze, in Fidenza, a beautiful Bed & Breakfast sustainable in the countryside awaits you. B&B Frutti Antichi is located in the oasis of Siccomonte, inside a farm that produces apples, pears and excellent variety of ancient fruits. 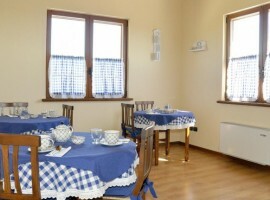 The property offers delightful organic breakfast, and independent rooms with amazing views. 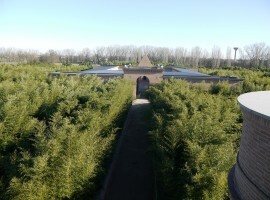 The maze of Masone is open daily (except Tuesday) from 10:30 to 19:00. 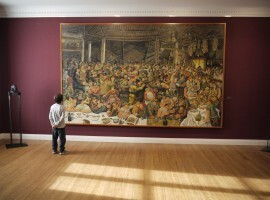 The entire ticket will cost 18 € and offers access to the whole complex and art collections. The card is free for children under 6 and reduced (€ 10) for children aged 6 to 12 years. Dogs have access to the maze, while only small ones can enter the exhibition space. All the paths of the labyrinth complex are barrier-free and therefore accessible to the disabled. 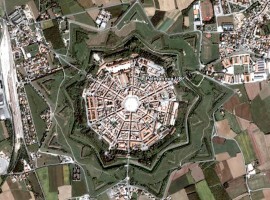 The Labyrinth is located in Strada Masone, 121 Fontanellato. For those arriving by train, the nearest stations are those of Fidenza and Parma. 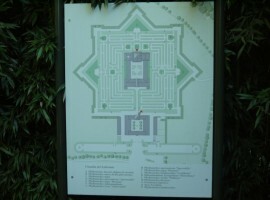 At this links you will find (in Italian) more details to reach the labyrinth, more information on fees and opening hours of the maze. This entry was posted in journeys, travel stories and tagged Italy, labyrinths, maze, Parma, Secret places, the largest maze in the world. Bookmark the permalink.